Nuestra Vida Dulce: Introducing Townes Nova! Our second baby boy entered the world, 3 days overdue, on Thursday, September 24th, 2015. His name is Townes Nova and we are all in love with this little guy, or Bubs, as David and Theron call him. 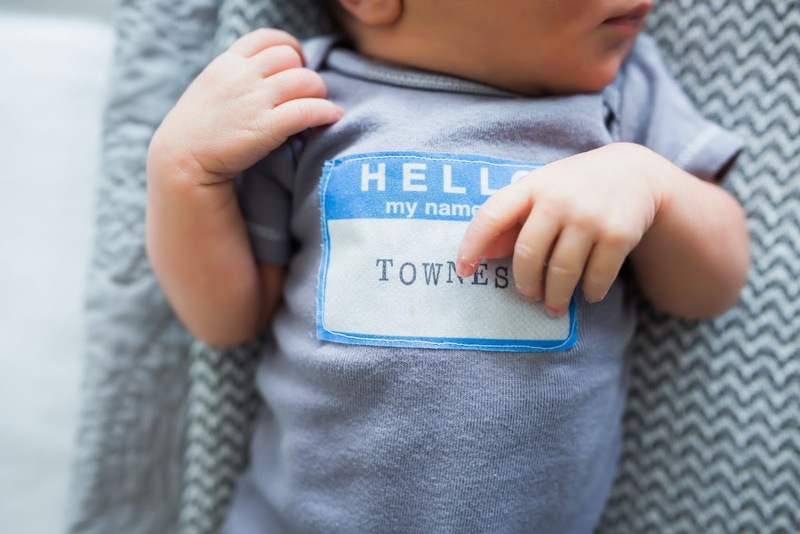 Townes' due date was on Monday, September 21st, but I was pretty certain he would be overdue. At my doctor's appointments my OB kept telling me my placenta was pretty far back and he wasn't convinced Townes would come on time. Theron was overdue too so I wasn't too concerned. I was hoping that my water would break like it did with Theron so I would know for sure when to head to the hospital! David and I were both fortunate to be off of work starting that Saturday before my due date so we just treated the days like it was summer vacation. We still sent Theron to school to maintain consistency and I did some projects around the house. We also did a little shopping, of course! On Wednesday, around 4 p.m., I started feeling crampy and the cramps were consistent. I told David and my Maw Maw and Paw Paw who were visiting for dinner that I thought I was having contractions. David started timing them and they were coming about every 18 minutes. Nothing to get too excited about. Later in the evening around 8 p.m. or so the contractions started coming more regularly and definitely more uncomfortably. David went to sleep and I quickly realized I wouldn't be able to. I tried to take a bath to take my mind off of them and downloaded a contractions app to make sure they weren't coming too close together. I knew sleep would be pretty impossible so I read the entire internet front to back--haha! I'm being dramatic but I was very uncomfortable. It was so different from Theron because I only ever felt contractions with him when I was already at the hospital and after I was given pitocin. These contractions with Townes felt very similar. Around 3:30 a.m. or so I decided I would try and get some sleep in between contractions. I managed to get maybe an hour or so before the contractions woke me up again. I must've been able to sleep through some because they were coming about every 10-14 minutes. I was a little nervous about living so far from my hospital [over an hour!] and not knowing when the right time would be to head out. However, knowing I had another doctor's appointment on Thursday morning kept me focused. If I could just make it to the appointment and then they could tell me what to do! We left that morning around 8 after dropping Theron off at school and took my last bump picture! When we got to the doctor the ultrasound tech asked how I was feeling and she decided to forego my fluid check and have the nurse practitioner check me instead. Once she did I was shocked to find out I was 4 cm dilated and nearly 100% effaced. All the ladies in the doctor's office were so happy for me and practically pushing me out to get to the hospital so I could get my epidural. So with that, David and I headed to our hospital [only 10 minutes from my doctor] and got checked in. I got my IV quite easily and waited to see how I would progress. I kept having pretty regular contractions but my water had not broke yet. So at 12:30 p.m. the in house doctor, who was very nice, came in and broke it. I was very scared of this but it turned out to be more uncomfortable than painful. He proclaimed that I was 6 cm dilated and "very stretchy". I wasn't in excruciating pain at this time but I knew for sure I wanted my epidural so I requested it at that time. At 1 p.m. the nurse anesthetist came in and gave me the epidural and it almost immediately kicked in. And this time around, I knew of the clicker to be able to get an extra dosage kick when/if I needed it. For about the next couple hours they kicked up my pitocin and I dilated pretty quickly I could tell when I was having contractions but was never in any pain. At 3:45 p.m. my nurse checked me and I was at a 9.5 so she decided to call my doctor. Then, at 4:15 p.m. she and another nurse came in and started preparing the room and area for go-time! They were joking that Dr. Hartman better hurry up because I was getting so close. We joked that we'd like to have the baby out at 4:34 p.m to have the same birth time as Theron. We had no idea just how close we would be and that if my doctor had been earlier it probably would have been on that time! When it was time to push, I started shaking just like I did with Theron, and was totally expecting to be pushing for almost two hours. But, much to my surprise, I only had to push through three contractions and Townes Nova made his appearance. Dare I say it but it was actually quite easy! I did end up tearing again, ugh!, but oh well! Thanks for reading and checking in! Congratulations!! He is just adorable. So glad things went smoothly this time around! Congratulations. Adorable. Can you let us know how you came to your sons' names? They are both very unique. Oh love, I'm so happy that Townes entered the world as smoothly as can be! Labor (and parenting two) is no walk in the park but you rocked it. YEAH MAMA!! Hope breastfeeding continues to go well & that Townes is mellow for you. You can do it, buddy.